The George Wright Forum is the journal of the George Wright Society. Published since 1981, The George Wright Forum is devoted to interdisciplinary inquiry about parks, protected areas, and cultural sites. We seek to publish critical thinking on all aspects of research, resource management, administration, and education as they relate to cultural and natural protected areas. Published three times a year, the journal is only available as part of membership privileges of the GWS or via a library subscription. However, non-members may order individual issues on-line or download PDF versions of our backlist through our comprehensive GWS Publications List. Interested in submitting an article for possible publication? Here are the guidelines. We invite you to sample the current issue of The George Wright Forum through the articles linked in the table of contents below. This material (excepted for previously published works republished here) is copyrighted by The George Wright Society. If you want to republish original articles, you must first obtain permission from us. The George Wright Forum encourages authors to submit articles that bear importantly on the Society's objectives: promoting the application of knowledge, understanding, and wisdom to policy-making, planning, management, and interpretation of the resources of parks, protected areas, and cultural sites around the world. We look for articles that have a strong point of view, are clearly articulated, and which report important new research findings, management techniques, or policy approaches. Articles from any area of cultural or natural resources are welcome. 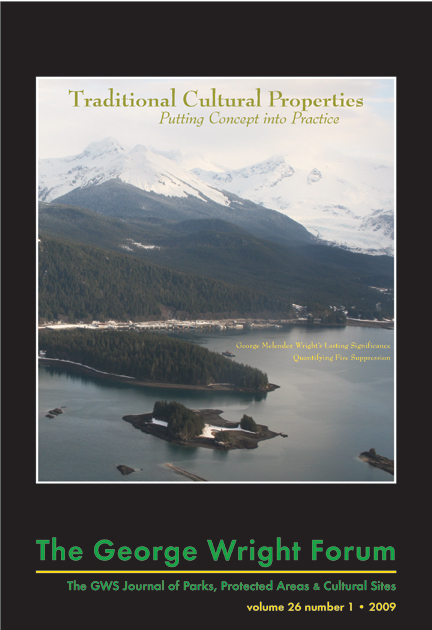 We actively seek manuscripts that represent a variety of protected area perspectives. Content standards for The George Wright Forum are maintained by the editor in consultation with the Publications Committee of the GWS Board of Directors. This policy enables The George Wright Forum to stay abreast of critical issues and emerging trends in the management of protected areas. Form of submission. We encourage submissions by e-mail, but will also accept articles in hard-copy manuscript (double-spaced) accompanied by CD. If submitting by e-mail, use the e-mail text as a cover letter. Do not embed the document--send it as an attachment. For all submissions, give complete contact details (including e-mails) for each author. Citations. Citations should be given using the author–date method (preferably following the format laid out in The Chicago Manual of Style). If the conventions of your field do not use this system (e.g., you wish to submit a paper with endnotes), please contact the editor before submitting. Editorial matters. Manuscripts submitted for consideration are reviewed by the editor and, as necessary, by the Publications Committee. This is not a formal peer-review process; however, if requested by an author, the editor will seek outside review of any individual manuscript. Generally, manuscripts that have been accepted are edited only for clarity, grammar, and so on. We contact authors before publishing if major revisions to content are needed. Because of tight publication deadlines, we do not routinely provide page proofs for authors to review (but may be able to do so, if requested). The George Wright Forum is distributed internationally; submissions should minimize provincialism, avoid academic or agency jargon and acronyms, and highlight broadly applicable advances and insights. Copyright and permissions. The George Wright Forum is copyrighted by the Society; written permission for additional publication is required but freely given as long as the article is attributed as having been first published here. We do consider certain previously published articles for republication in The George Wright Forum. Authors proposing such articles should ensure all needed copyright permissions are in place before submitting the article for consideration. Permissions and attributions should be submitted for all photos and other graphics requiring them. Illustrations. We prefer to receive illustrations electronically, and will accept digital files on CD-ROM, DVD, or (with prior approval by the editor) as e-mail attachments. All graphics MUST be in TIFF, JPG, or EPS format and sourced at 300 dpi (for photographs) and 300 to 1200 dpi (for graphs, charts, and other line art) when sized at approximately 4x6 inches. NO OTHER FORMATS OR RESOLUTIONS ARE ACCEPTABLE. Each graphic must be submitted in a separate file, NOT embedded in a text document. A separate text document containing captions and credits must be submitted. If in doubt, please contact us. We particularly welcome good, vertically oriented, color photos for use on the cover. Keep in mind that all photos and other graphics on inside pages are run in black-and-white. Therefore, do not make reference to specific colors in graphics (e.g., "The red line represents so-and-so") because all graphics get grayscaled before publication. Also, be aware that many highly detailed maps that are meant for on-screen viewing or printing in color, such as are commonly produced with GIS software, will lose fine detail when grayscaled; certain features that stood out easily in color may be indistinguishable from each other when grayscaled. We strongly suggest you preview such maps in grayscale before submitting. We also accept hard-copy illustrations for scanning into digital format. Submit original (not photocopied) line drawings, charts, and graphs as nearly "camera-ready" as possible. If submitted in a size that exceeds The George Wright Forum’s page dimensions (6x9 inches), please make sure the reduction will still be legible. Avoid the use of dark shading in graphics. The preferable form for photographs is black-and-white (matte or glossy) prints. Medium contrast makes for better reproduction. Color prints and slides are also acceptable; half-tones and photocopies are not. Please provide captions and credits and secure copyright permissions as needed, and indicate whether you wish materials to be returned. The Society also welcomes proposals for sets of articles under a common theme. Thematic sets comprise anywhere from three to eight articles prepared under the guidance of one or more guest editors. To propose a set of thematic articles, contact the editor with a short (1-2 pp.) prospectus listing the name(s) of the guest editor(s), the titles and authors of the proposed articles, and one or two paragraphs explaining the theme and its importance.